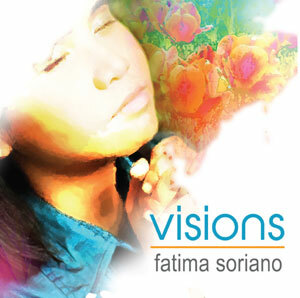 Celebrate faith and reunite with God through Marian devotee and blind singer Fatima Soriano's music in her first ever music compilation under Star Records titled Visions. The album features six inspirational songs including "Nandito Lang Ako," and "Mahiwaga," which were the theme songs of defunct ABS-CBN teleseryes Momay and 100 Days to Heaven, respectively. Completing the tracklist are revivals of worship songs "Lift Up Your Hands," "Mariang Ina Ko," "Give Thanks," and "Sino Ako." Also included are minus one versions of "Lift Up Your Hands," "Mariang Ina Ko," and "Sino Ako." Visions is produced by the "Inspirational Diva" Jamie Rivera. Be touched and inspired by Soriano's Visions. Grab your own copy in record bars nationwide.